In this blog post, I will detail how certain members of Overstock.com's (NASDAQ: OSTK) unprincipled management team conned investors into believing that the company's non-compliant EBITDA disclosures were in compliance with Securities and Exchange Commission Regulation G, governing non-GAAP disclosures. I believe that Overstock.com's non-compliant EBITDA disclosures that materially overstated the company's financial performance, together with other false and misleading representations by management, expose them to possible violations of anti-fraud Rule 10b-5. In my last blog post, I detailed how Overstock.com finally amended its financial reports to comply with SEC Regulation G, almost a year after it was notified by me of its violations. This blog was first in exposing how Overstock.com used a non-compliant EBITDA measure to overstate its financial performance from Q2 2007 to Q2 2008. Other bloggers, such as forensic accountant Tracy Coenen, NY Times columnist Floyd Norris, and investigative reporter Gary Weiss also reported about Overstock.com's non-compliant EBITDA measures, too. However, the company stubbornly refused to correct its non-compliant EBITDA measures and continued to materially overstate its financial performance. Instead, CEO Patrick Byrne retaliated with a malicious smear campaign directed at his critics in an effort to discredit them. Even as Overstock.com finally attempted to correct its non-compliant EBITDA disclosures in its latest Q3 2008 10-Q report and other amended reports recently filed with the SEC, the company continued to violate certain other disclosure requirements under Regulation G by failing to fully disclose its change from using a non-compliant EBITDA measure to a compliant renamed "Adjusted EBITDA" measure. It should come as no surprise that Overstock.com is unable or rather unwilling to provide accurate financial disclosures and comply with securities laws. Throughout Overstock.com's entire history, there has been a continuous pattern of untrue, false, deceitful, inconsistent, and contradictory disclosures made by the company and certain members of its management team led by CEO Patrick Byrne. In a previous blog post, I provided details dating back to 2000, how Patrick Byrne deceptively used non-GAAP revenues to hype Overstock.com's top-line performance, while at the same time claiming that Overstock.com was GAAP profitable, even though the company was not profitable at all. In February 2006, Overstock.com disclosed inventory accounting errors and restated financial reports from 2002 to Q3 2005. In January 2008, the Securities and Exchange Commission discovered that Overstock.com's revenue accounting failed to comply with Generally Accepted Accounting Principles (GAAP), since the company's inception. The company provided the SEC with a flawed and misleading materiality analysis to convince them that its revenue accounting error was not material. The company wanted to avoid a restatement of prior affected financial reports arising from intentional revenue accounting errors uncovered by the SEC. Instead, the company used a one-time cumulative adjustment in its Q4 2007 financial report, apparently to hide the material impact of such errors on previous affected individual financial reports. This blog detailed how Overstock.com's materiality analysis was seriously flawed and misleading and called on Overstock.com to restate its financial reports. Despite emails to Overstock.com, the company stubbornly refused to restate its financial reports. On October 24, 2008, Overstock.com's Q3 2008 press release disclosed new customer refund and credit errors and the company warned investors that all previous financial reports issued from 2003 to Q2 2008 “should no longer be relied upon.” This time, Overstock.com said it would restate all financial reports dating back to 2003. In addition, Overstock.com reversed its one-time cumulative adjustment in Q4 2007 used to correct its revenue accounting errors and instead restated all financial statements to correct those errors, too, as I previously recommended. However, Overstock.com continued to violate Regulation G and report a non-compliant EBITDA measure in its Q3 2008 press release. During the Q3 2008 earnings call that followed, Overstock.com CEO Patrick Byrne and President Jonathan E. Johnson responded to questions in my blog, posted the day earlier, about the company's non-compliance with Regulation G. Byrne and Johnson made untrue material statements and omitted material facts at they attempted to con investors into believing that its EBITDA disclosures complied with Regulation G. Afterwards, I again called on Overstock.com to change its non-compliant EBITDA measures to comply with Regulation G.
Finally, on November 10, 2008, Overstock.com amended its financial reports from Q2 2007 to Q3 2008 to comply with SEC Regulation G. However, Overstock.com still violated Regulation G by failing to fully disclose its change from using a non-compliant EBITDA measure to a compliant renamed "Adjusted EBITDA" measure. Below, I will describe why Overstock.com and certain members of management may be "subject to litigation and regulatory action," including Rule 10b-5 violations, due to their willful failure to comply with SEC disclosure requirements. Starting in November 2007, I notified Overstock.com of its Regulation G violations and material overstatements of its financial performance from using a non-compliant EBITDA in emails Cc’d to the SEC. Read receipts for those emails were acknowledged by both Overstock.com and the SEC. However, Overstock.com stubbornly continued to report a non-compliant EBITDA disclosure until November 10, 2008, when released its latest Q3 2008 10-Q report. During the same period that Overstock.com used a non-compliant EBITDA to materially overstate its financial performance, company President Jonathan E. Johnson and CFO David Chidester unloaded stock at huge profits. During certain earnings calls, Patrick Byrne, Jonathan Johnson, and David Chidester made outright false and deceptive statements to investors in order to mislead them into believing that the company's reported EBITDA did not violate Regulation G. Their actions show a clear intent to "deceive, manipulate, or defraud investors" and should satisfy scienter requirements for a Rule 10b-5 violation. 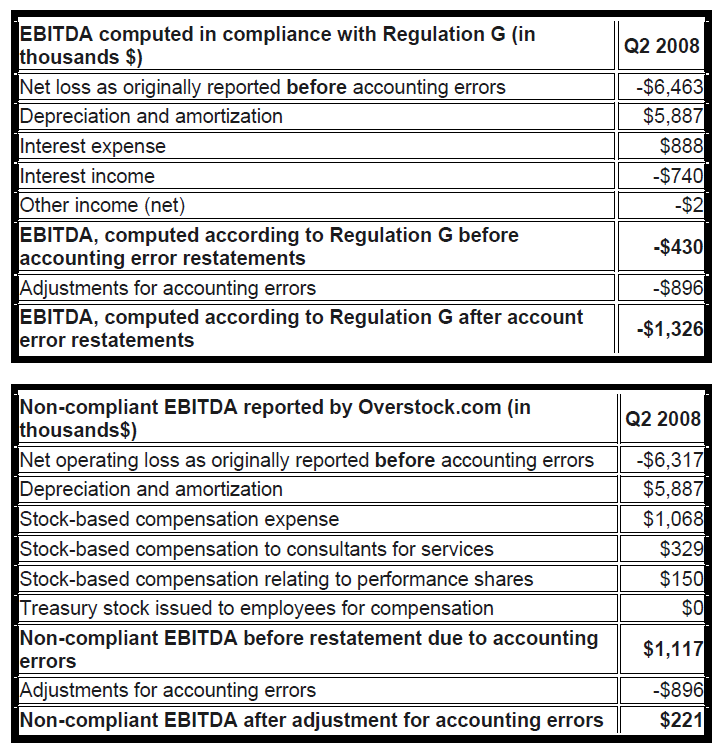 In financial reports issued from Q2 2007 to its recent Q3 2008 press release, Overstock.com improperly reconciled its non-compliant EBITDA to operating loss, rather than net loss (the most directly comparable GAAP measure required under Regulation G guidance), and improperly removed stock-based compensation costs from its non-compliant EBITDA disclosure. 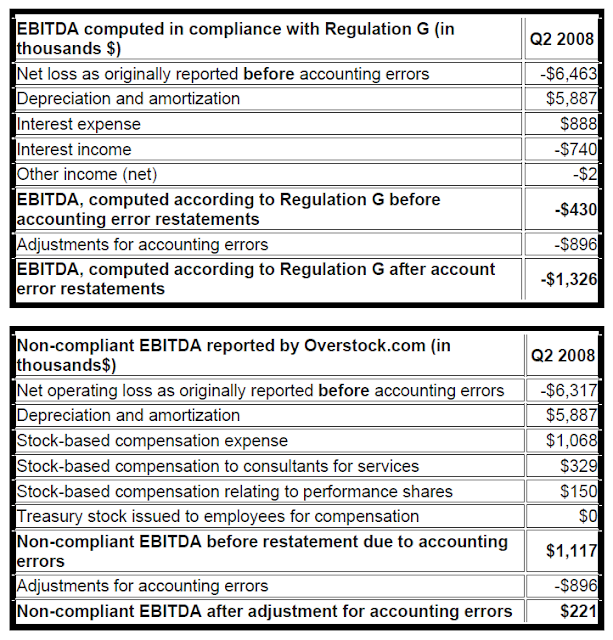 As a result of Overstock.com's violations of Regulation G, the company materially overstated its non-compliant EBITDA in financial reports from Q2 2007 to Q2 2008, including comparable non-compliant EBITDA numbers for each period. Since Overstock.com improperly reconciled its non-compliant EBITDA to operating loss, rather than net loss, EBITDA was materially overstated by the amount of non-operating items such as losses from discontinued operations in certain periods. In addition, since Overstock.com improperly removed stock-based compensation from its non-compliant EBITDA during each period, the company materially overstated EBITDA by such amounts. Therefore, Overstock.com's non-compliant EBITDA disclosure was "materially deficient" under Regulation G.
Disclosure pursuant to Regulation G that is materially deficient may, in addition to violating Regulation G, give rise to a violation of Section 10(b) or Rule 10b-5 thereunder if all the elements for such a violation are present. In this regard, we reminded companies in December 2001 that, under certain circumstances, non-GAAP financial measures could mislead investors if they obscure the company's GAAP results. We continue to be of the view that some disclosures of non-GAAP financial measures could give rise to actions under Rule 10b-5. One specific issue cited by the SEC that could give rise to a Rule 10b-5 violation is that "under certain circumstances, non-GAAP financial measures could mislead investors if they obscure the company's GAAP results." One way that a non-GAAP measure can "obscure the company's GAAP results" is for a company to report a GAAP net loss while using a non-compliant EBITDA measure to produce positive financial performance. In Q2 2008, Overstock.com originally reported a net loss of $6.463 million before its later disclosed adjustments due to accounting errors. In that same quarter, Overstock.com originally reported a non-compliant EBITDA of positive $1.117 million. If Overstock.com had reported EBITDA in compliance with Regulation G, EBITDA should have been reported at negative $430K, before adjustments due to accounting errors. Therefore, Overstock.com's non-compliant EBITDA measure in Q2 2008 clearly does "obscure the company's GAAP results." Worse yet, later accounting errors disclosed by Overstock.com caused a further overstatement of EBITDA in the amount of $896K. Therefore, a compliant EBITDA, after adjusting for accounting errors, should have been reported at negative $1.326 million, rather than positive $1.117 million, as originally claimed by Overstock.com. Rule 10b-5 is the bedrock upon which federal securities law is built. According to Rule 10b-5, it is the presentation of "untrue statement of a material fact" or the omission of a "material fact" that gives rise to a securities fraud. Since Overstock.com's non-compliant EBITDA measure violated Regulation G and materially overstated the company's financial performance, there is an "untrue statement of a material fact" in violation of Rule 10b-5. In addition, Overstock.com's willful failure to disclose that its non-compliant EBITDA violated Regulation G, qualifies as "unlawful...to omit to state a material fact necessary in order to make the statements made, in the light of the circumstances under which they were made, not misleading," under Rule 10b-5. The language of Regulation G's general disclosure requirement above, is almost the same language in Rule 10b-5. Both Regulation G and Rule 10b-5 prohibit "an untrue statement of a material fact" or the omission of a "material fact" that causes a financial disclosure to be "misleading." Despite prior notice by me of Overstock.com violation's of Regulation G, certain members of management continued to make "untrue" statements of "material facts" and omitted other material facts in an attempt to deceive investors into believing that the company was in compliance with Regulation G. Those actions expose them to potential rule 10b-5 violations. David Chidester: Just – there is different ways people calculate EBITDA I think. We just want to make sure it’s clear that our calculation of EBITDA does include stock based compensation. What both Patrick Byrne and David Chidester failed to tell investors was that Overstock.com improperly reconciled its non-compliant EBITDA to operating losses, rather than net losses (the most directly comparable GAAP measure required under Regulation G guidance). In addition, Chidester falsely claimed that stock-based compensation costs can be properly excluded from EBITDA. Under Regulation G guidance, any such non-GAAP measure cannot be called EBITDA. In other words, EBITDA is strictly net income or loss (not operating income or loss), before interest, taxes, depreciation, and amortization (nothing else can be excluded from EBITDA). There is different ways people calculate EBITDA I think… It’s completely the convention in our industry and I think because it’s a new – it only came about a couple of years ago, everybody pretty much excludes it when they talk about EBITDA and talk about cash earnings. David Chidester cannot claim that following the accounting practices of other non-compliant companies validated Overstock.com’s non-compliant EBITDA disclosures. 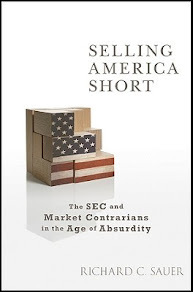 Contrary to David Chidester’s comment above, SEC Regulation G was issued more than “a couple of years ago” and became effective on March 28, 2003. Worse yet, SEC Staff Accounting Bulletin No. 99 issued way back in August 1999, expressly states that “Authoritative literature takes precedence over industry practice.” In this case, authoritative literature (Regulation G) already existed and took precedence over the so-called "industry practice" of non-compliant companies. Well, okay. Well, EBITDA fourth consecutive quarter of positive EBITDA. Again, I am not a huge fan of this number but it is meaningful in some circumstances and it does describe something for us. Slide 11, trailing twelve month EBITDA is now at $9.6 million. I think that has a – that’s the valley of death and we seem to be climbing out the far side. Contrary to Patrick Byrne’s false claims above, Overstock.com did not achieve its “fourth consecutive quarter of positive EBITDA" and was not climbing out the far side" of the "valley of death." If Overstock.com had reported EBITDA in compliance with Regulation G in Q2 2008, the company would have reported a negative EBITDA compared to a positive EBITDA in the previous quarter. Therefore, EBITDA would have dropped in Q2 2008 compared to the previous quarter. If we also take into account adjustments for subsequent accounting errors, Overstock.com would have reported a negative EBITDA in two of those four quarters (Q4 2007 and Q2 2008). In Q2 2008, Overstock.com’s properly computed EBITDA, before subsequent accounting errors, should have been reported as $-430K and not positive $1.117 million, as originally reported. If we include later disclosed accounting error adjustments, Overstock.com should have reported a $-1.326 million EBITDA. Overstock.com's “trailing twelve month EBITDA, before subsequent accounting errors, should have been reported at $5.145 million and not "$9.6 million" as hyped by Byrne. If we include later disclosed accounting error adjustments, Overstock.com should have reported a meager $1.229 million EBITDA. In other words, Overstock.com overstated EBITDA over seven-fold! Patrick Byrne: The claim that EBITDA is not compliant with SEC definition, nonsense. Our EBITDA reconciles to GAAP. The SEC says you have to reconcile EBITDA to GAAP. We follow, I believe, the general industry practice and the A in EBITDA, amortization of stock-based compensation, our EBITDA excludes it. Moreover we reconcile everything to GAAP. Sam Antar the Crook has pointed out as a couple of people have received comment letters. They were people who had not reconciled to GAAP. In any case, we’ve gone through this over and over with our lawyers. They’re saying you’re doing this right. Jonathan, do you want to add anything? Patrick Byrne misled investors by claiming that, “Our EBITDA reconciles to GAAP.” A non-GAAP measure, such as EBITDA, is required to be reconciled with the most “directly comparable GAAP measure” under Regulation G, and not just any GAAP measure that management feels like using. 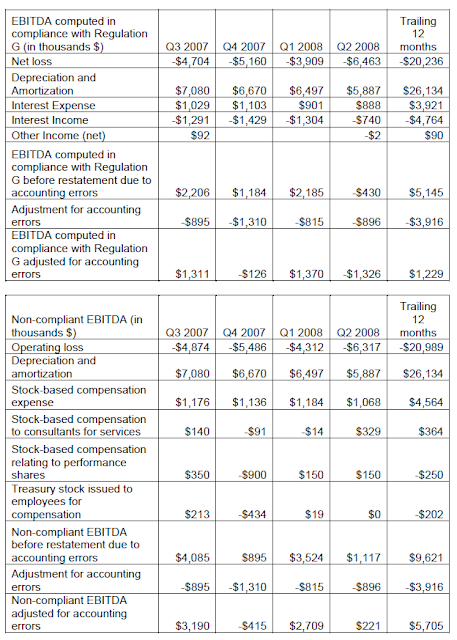 As described above, Overstock.com improperly reconciled its non-compliant EBITDA measure to operating loss, rather than net loss, which is the most directly comparable GAAP measure under Regulation G. In addition, Byrne’s claim that following “general industry practice” somehow validated Overstock.com’s non-compliant EBITDA disclosure was utter nonsense, too. SAB No. 99 clearly requires a company to follow authoritative literature (Regulation G) over industry practice. Patrick Byrne had claimed that, “Sam Antar the Crook has pointed out as a couple of people have received comment letters. 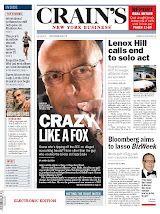 They were people who had not reconciled to GAAP.” Patrick Byrne’s claim is untrue. As I described in a previous blog post, the SEC required CKX Inc. and CGG Veritas to change their non-compliant EBITDA measures to conform to Regulation G. CKX Inc., like Overstock.com, reconciled its non-compliant EBITDA measure to operating income or loss (a GAAP number) but not to net income or loss which is the most directly comparable GAAP financial measure” as required by SEC Regulation G. CGG Veritas, like Overstock.com, improperly eliminated stock-based compensation expenses from its non-complaint reported EBITDA. Patrick Byrne wanted investors to believe that stock-based compensation costs are properly excluded from EBITDA as an amortization expense. However, as cited in the SEC comment letter to CGG Veritas, the SEC did not agree with Overstock.com's claim that stock-based compensation costs are properly excludable from EBITDA. Patrick Byrne claimed that "In any case, we’ve gone through this over and over with our lawyers." However, just two weeks later on November 11, Overstock.com issued its Q3 2008 10-Q report and changed its non-compliant EBITDA disclosures to comply with Regulation G. Therefore, the findings of this blog that Overstock.com used a non-compliant EBITDA in violation of Regulation G were vindicated by Overstock.com's revised disclosures in its Q3 2008 10-Q and other amended financial reports. Still, Overstock.com violated Regulation G again, since the company did not fully disclose its change from a non-compliant EBITDA measure to a compliant "Adjusted EBITDA" measure. Therefore, a company cannot change its “method of calculating or presenting a non-GAAP financial measure from one period to another, without a complete description of the change in that methodology.” If a company fails to make such a disclosure, it violates Regulation G and possibly Rule 10b-5. Overstock.com simply amended its previous financial reports to rename its non-compliant EBITDA disclosure to "Adjusted EBITDA" without any "description of the change" in that non-GAAP financial measure. In addition, during other periods Overstock.com used inconsistent calculations to compute its non-compliant EBITDA disclosures and failed to disclose "a complete description of the change" in "methodology" used to calculate EBITDA. For example, Overstock.com’s Q2 2007 10-Q and Q3 2007 10-Q does not eliminate restructuring charges from both is reported quarterly and year-to-date reported EBITDA. I note that during fiscal year 2007, all of restructuring charges totaling $12.283 million occurred in Q1 and Q2 2007 and no other quarters. In contrast, in Overstock.com’s fiscal year 2007 10-K , the company's year-to-date EBITDA eliminates $2.169 million of the $12.283 restructuring charges that were included in previously reported year-to-date EBITDA calculations in Q2 2007 and Q3 2007. We believe that, because our current capital expenditures are lower than our depreciation levels, discussing EBITDA at this stage of our business is useful to us and investors because it approximates cash used or cash generated by the operations of the business. However, in its "current" period Q3 2008, Overstock.com's capital expenditures were higher than depreciation expenses, contrary to the company's disclosure above. During Q3 2008, Overstock.com's capital expenditures of $8.8 million exceeded depreciation and amortization expenses of $5.6 million by $3.2 million or 57%. In Overstock.com's Q3 2008 10-Q report issued about two weeks later, the company changed its misleading disclosure. A multiple of EBITDA is currently the most standard measure of valuation in the industry. Various analyst reports issued by Scott W. Devitt from Stifel Nicholas, Shawn C. Milne from Oppenheimer, and Justin Post from Merrill Lynch have valued Overstock.com in terms of multiples of EBITDA. Therefore, a material overstatement of reported EBITDA by Overstock.com results in a materially significant over-valuation of the company and causes investors to buy stock and allows insiders to sell stock at overvalued prices. During the same period that Overstock.com used a non-compliant EBITDA and materially overstated its financial performance, both company President Jonathan Johnson and CFO David Chidester sold stock at substantial profits. In April 2008, Jonathan Johnson unloaded 55,922 shares at an average price of $17.11 per share (Source: Form 4 here and here). In May 2008, David Chidester sold 2,766 shares of common stock at an average price of about $27.80 per share and pocketed about $77,000 in gross proceeds. Last Friday, Overstock.com closed at just $6.80 per share. Recent stock sales this year by CFO David Chidester are subject to the clawback provisions under Sarbanes-Oxley Section 304. David Chidester's false and misleading comments during the Q2 2008 earnings call described above, certainly qualify as "misconduct" under Sarbanes-Oxley 304. It is unfortunate that Section 304 only applies to CEOs and CFOs and not necessarily to Jonathan Johnson, as President of the company. The SEC and shareholders seeking damages will have to sue the company, its board of directors, and management to recover damages and seek to enjoin the company and its officers from making up new lies to investors and stop further securities law violations. Overstock.com's D & O carrier may have substantial future claims to contend with.